Nutritional data does not include almonds. Cook tortellini according to directions on package; drain. 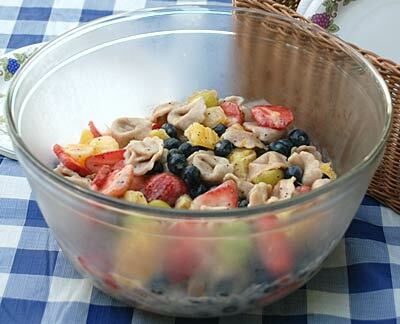 In a large bowl, add pasta and fruit. Pour dressing over salad and toss lightly; refrigerate until ready to serve. If desired, sprinkle sliced almonds over salad just before serving. Note: Other fruits such as bananas, peaches, apples, and navel oranges may be used.